Create free account on https://www.apixu.com. Once this is done you will see API key which will be used in the script below. Make sure that your script does not fetch data too quickly (not less than once in 5 minutes). In this example, we will fetch the data every 10 minutes. In the below script change key variable to your API key, location variable to required location in textual form. 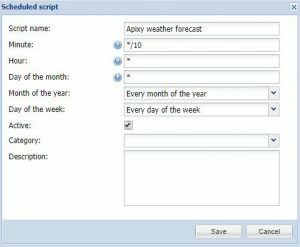 This example fetches current weather condition and forecast for today and tomorrow. Fields can be found in apixu documentation: https://www.apixu.com/doc/forecast.aspx (day Element).